There’s never been a better time to work at XIFIN. We’re growing at an amazing rate, and new career opportunities are opening up every day. We are seeking dynamic and highly motivated professionals to join our team and contribute to our continued growth and success. You must be organized, driven and focused, and have that special ability to adapt and learn in a rapidly changing technical and industry environment. We are proud to be an Equal Opportunity Employer. Join our revolution and find your dream job. A dream job starts with passionate people who do work that matters, win as a team, and celebrate success together. It ends with knowing that together, we are the force innovating healthcare diagnstoics with end-to-end connectivity from patient to payment. In between, there is fulfilling work as key contributors in healthcare diagnostics. Guided by our vision and values, we are working to unlock a world where healthcare operates with efficiency and makes informed, optimized decisions, and where information is leveraged both to build healthy organizations and to deliver the best care and patient outcomes possible. We are living our dream jobs. Join us! The best way to get to know us and find out how we work together is through the words of our employees. Learn more about our culture at XIFIN and how we work together to help customers. Exceed Customer Expectations: We know customers are at the center of everything we do, and we work tirelessly to deliver experiences that turn customers into fans. Strive for Excellence: We strive for excellence in all we do. We are accountable for our actions and outcomes, and we take personal responsibility for delivering great results. Maintain Strong Ethics: We hold ourselves and each other to the highest standards in all we say and do. XIFIN is dedicated to a vision of optimizing the economics of healthcare. We believe this vision is the key to unlocking a world where healthcare operates with efficiency and makes informed, optimized decisions, where information helps build healthy organizations and deliver the best care and patient outcomes possible. 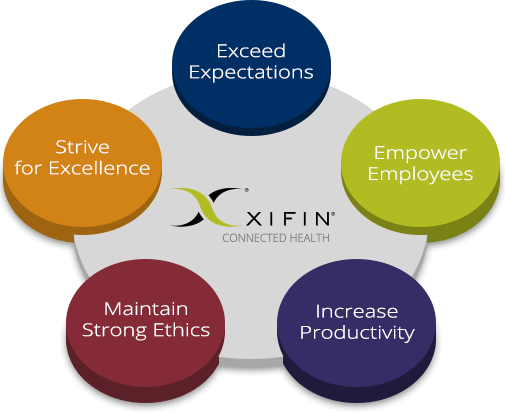 XIFIN’s mission is to deliver value to our customers through exceptional technology and services that provide the necessary connectivity, metrics and knowledge to enable healthcare providers to optimize their business and financial operations while helping to optimize healthcare delivery and outcomes. XIFIN is a health information technology company that leverages diagnostic information to improve the quality and economics of healthcare. Our technology platform facilitates connectivity and workflow automation for accessing and sharing clinical and financial diagnostic data, linking healthcare stakeholders in the delivery and reimbursement of care.